In Halo, Georgia, folks know Cherry Tucker as big in mouth, small in stature, and able to sketch a portrait faster than buckshot rips from a ten gauge — but commissions are scarce. So when the well-heeled Branson family wants to memorialize their murdered son in a coffin portrait, Cherry scrambles to win their patronage from her small town rival. As the clock ticks toward the deadline, Cherry faces more trouble than just a controversial subject. 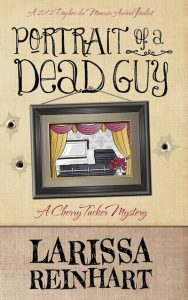 Between ex-boyfriends, her flaky family, an illegal gambling ring, and outwitting a killer on a spree, Cherry finds herself painted into a corner she’ll be lucky to survive. I had an idea for a redneck artist character when my father suddenly passed. While I was staying with my mother, mourning my dad and I distracted myself by thinking about the characters. If the artist had to paint a coffin portrait for a murdered victim, she could easily get wrapped up into solving the crime. And that's where I knew I had the story. My character, Cherry Tucker, is a professionally trained artist but a country girl, raised on a farm, and proud of her redneck roots. I liked the contradiction. I'm from a small farming town and I had a background in art and art history. I was listening to a lot of Miranda Lambert at the time and her music inspired the flavor of Cherry Tucker. She's sassy, Southern, and real spitfire, like the characters Miranda Lambert sings about. In a small town, there is a thin gray line between personal freedom and public ruin. Everyone knows your business without even trying. Folks act polite all the while remembering every stupid thing you’ve done in your life. Not to mention getting tied to all the dumbass stuff your relations — even those dead or gone — have done. We forgive but don’t forget. I thought the name Cherry Tucker carried some respectability as an artist in my hometown of Halo. I actually chose to live in rural Georgia. I could have sought a loft apartment in Atlanta where people appreciate your talent to paint nudes in classical poses, but I like my town and most of the three thousand or so people that live in it. Even though most of Halo wouldn’t know a Picasso from a plate of spaghetti. Still, it’s a nice town full of nice people and a lot cheaper to like my town and most of the three thousand or so people that live in it. Even though most of Halo wouldn’t know a Picasso from a plate of spaghetti. Still, it’s a nice town full of nice people and a lot cheaper to live in than Atlanta. Halo citizens might buy their living room art from the guy who hawks motel overstock in front of the Winn-Dixie, but they also love personalized mementos. Portraits of their kids and their dogs, architectural photos of their homes and gardens, poster-size photos of their trips to Daytona and Disney World. God bless them. That’s my specialty, portraits. But at this point, I’d paint the side of a barn to make some money. I’m this close from working the night shift at the Waffle House. And if I had to wear one of those starchy, brown uniforms day after day, a little part of my soul would die. Actually a big part of my soul would die, because I’d shoot myself first. When I heard the highfalutin Bransons wanted to commission a portrait of Dustin, their recently deceased thug son, I hightailed it to Cooper’s Funeral Home. I assumed they hadn’t called me for the commission yet because the shock of Dustin’s murder rendered them senseless. After all, what kind of crazy called for a portrait of their murdered boy? But then, important members of a small community could get away with little eccentricities. I was in no position to judge. I needed the money. After Dustin’s death made the paper three days ago, there’d been a lot of teeth sucking and head shaking in town, but no surprise at Dustin’s untimely demise from questionable circumstances. It was going to be that or the State Pen. Dustin had been a criminal in the making for twenty-seven years. Not that I’d share my observations with the Bransons. Good customer service is important for starving artists if we want to get over that whole starving thing.